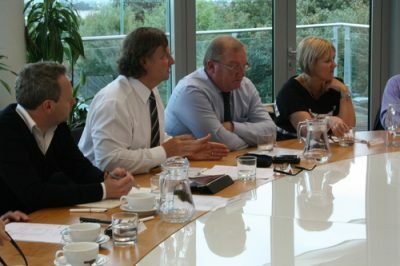 In the first of a series of events for the Kent Design programme, a collaborative mix of key public and private sector figures were invited to the first roundtable to discuss the issues of growth, quality and planning throughout Kent and Medway. The event was generously hosted by planning consultants Barton Willmore at the Ebbsfleet Observatory on Tuesday 8 October 2013. Chaired by the Department for Communities and Local Government’s Chief Planner, Steve Quartermain, the afternoon provided a great opportunity to hear more about Kent Design and to discuss what participants thought should be the FUTURE focus for Kent and Medway. Barton Willmore Design Planner, Huw Edward, welcomed all attendees to the discussion. Chris Lamb provided an introduction of Kent Design; emphasising the programmes aim of providing a platform for sharing knowledge, collaborating across sectors, networking and helping to shape the future of Kent and Medway. Steve Quartermain provided a brief introduction of himself and explained his reasoning for attending the event – to encourage discussion, listen to people’s views and to take away ideas to help shape policy. At the centre of discussion was the government’s design agenda and special attention was given to the National Planning Policy Framework; particularly the document’s emphasis on design being a core planning principal and the clear intention to endorse design and innovation in building new homes and communities. Although many planning reforms have now been implemented, it was acknowledged that there is still some work to be done – it was stressed that the system is now better for developers and much more efficient with a faster application process and decisions. Would you want your family/friends to live there? Is it a design you’d be proud to tell people you were involved in? Would you happy to have it at the end of your back garden or next door to you? The conversation then moved onto the importance of good design at local level, in planning policy and decision making, to ensure the delivery of high quality new homes. This was also strongly supported by all attendees, with focus falling on how this could be most successfully achieved. The afternoon concluded with a summary of the meetings discussion, with two things to keep in mind: 1. Although role of good design in the national planning system is essential, the outcomes and application at a local level is just as important and that high standard must be maintained. 2. Everyone in the industry needs to keep asking themselves the same question – Are we doing all we can to ensure these new measures are helping us achieve quality housing? Steve Quartermain, Chris Lamb and hosts Barton Willmore thanked everybody for attending the meeting and were certain that these discussions would continue beyond this roundtable event helping to ensure we continue to deliver high quality new homes in Kent.